NOTE: Cover is not intended for trailering. 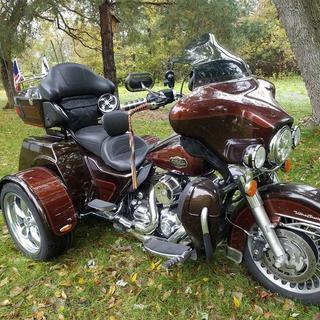 This is my first trike (H-D TriGlide Ultra) and I was looking for a quality outdoor cover for it. The cover fits perfectly. I really like the fact that it comes with a travel case so that it rolls up to a convenient size. I would definitely recommend this cover. Received my TRK355 Trike cover and was really impressed with the Quality and Workmanship of the cover. 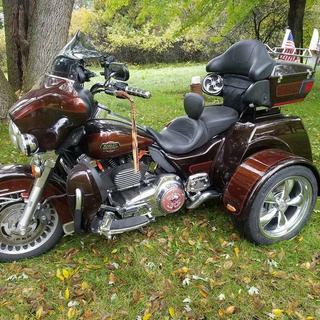 Recently had my Ultra Classic converted into a custom trike. Cover fit PERFECTLY. Easy to install by myself with no help. hi i ordered it for my dad he is very happy with the new cover fits great he said , and also i am happy with every order i have placed i tell everyone to shop with you !!!! This cover is 100% rain proof, and keeps my HD TriGlide Ultra Classic bone dry ! It works and is well made, but I ordered a grey 58 inch, received a blue 65 inch. It is like trying to handle a tent. I have a 2018 tri glide ultra with a 12 inch wind shield instead of the 10 inch it comes with. Will it fit?? BEST ANSWER: I bought a TRK 350 Trike cover last spring and found it to above my satisfaction. It is light enough to work with but heavy enough that it is a tough cover. The zipper access to the rear is a real plus. I would have no hesitation in recommending to buy this cover, it's a good value. It might be snug fit but I think it will work. Great cover!!! How wide and long will this cover? Current trike is 59 wide by 108.